Taylor Brorby and Ice Cube press released Coming Alive: Action and Civil Disobedience. 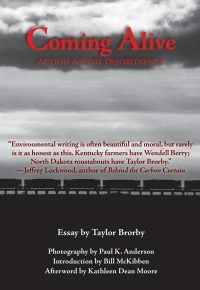 Produced in less than a month, Coming Alive, as a call-to-action extended essay by Taylor Brorby, introduced by climate expert Bill McKibben (350.org), along with an afterword by nationally known author / environmental activist Kathleen Dean Moore. Additionally, the project is complemented with photography from Paul Anderson. The project has received endorsements from some of the best writers and thinkers in our country. The book is available as an Ebook or in book form from Ice Cube Press. Listen to an interview with Taylor Brorby about his battle with fossil fuels and his family roots in the coal industry. Coming Alive asks us all to wake up to the reality of what is to come, as well as our continued dependence upon fossil fuels. Coming Alive is what we need: an example of how to solve our problems, not just more talk about them.